Enterprise Holdings and its brands have been recognized by several travel industry organizations in 2016, such as Travel Weekly and the American Society of Travel Agents. 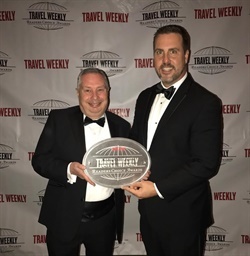 Enterprise was named Best Domestic Car Rental Company at Travel Weekly’s 14th Annual Readers Choice Awards, and Travel Weekly recognized Enterprise with three Magellan Awards earlier in 2016. Enterprise Holdings was also honored in Travel + Leisure’s World’s Best Awards for its three brands: National, Enterprise, and Alamo. Enterprise Holdings was recognized by the American Society of Travel Agents as its 2016 ASTA Car Rental Company of the Year, chosen as Most Admired Car Rental Company from daily travel business newsletter The Beat, ranked as top preferred car rental brands in Business Travel News, chosen as Best Car Rental Company in North America in Business Traveler USA, and awarded silver in the car rental category at Recommend magazine’s Annual Readers’ Choice Awards. Enterprise Holdings currently operates in more than 85 countries and has more than 9,600 airport locations, according to the company.